A big part of this job lately seems to be in education - going over redundancy and recovery mechanisms and options with clients in advance of doing a design, and certainly well before a build. While many of these mechanisms have been with us for years, in many large companies decision makers don't seem to be aware of what is available to them, native on the box and for free. The other thing that struck me is that even when I'm "preaching to the choir" - when the folks I'm working with know what their gear can do, and in many cases have already built their infrastructure the right way - people aren't aware of the security implications of the tools we use to make our infrastructure reliable and/or redundant. Each thing we do to make things better gives an attacker another method to attack or compromise things. While I seem to be drawing the same "Enterprise 101" diagram a few times per week, lately it's been a coin toss whether it's been for an "Enterprise 101" discussion, or an "Enterprise Attack / Defense 101" whiteboard talk. This entire ball of worms seems like a good discussion for an ISC Diary. I'll start the conversation with an "Enterprise 101" review, outlining each of the mechanisms we'll discuss. In upcoming diaries, we'll tackle each of the reliability methods, and discuss how they're sometimes not as reliable as you think they are, what security pieces they are missing, why defaults are BAD, and how to secure them (if possible). I'm hoping that our readers will help out. If I've missed a topic you'd like to see, please let us know in the comment form. If I've overlooked a topic, or if I haven't explained things completely (or just plain errored out or otherwise missed the boat), please use our comment form and fill us all in. Enterprise 101 - "The Good"
I'll start off this week with the textbook descriptions. What the more common reliability methods are, what they do, why you might implement them. This discussion will be a tad non-technical, but don't worry, when we start breaking stuff in later diaries, we'll get to see some configuration examples, "real" tools and in some cases packets. Even this high level conversation I think has a lot of value - lots of folks aren't aware of basic mechanisms for ensuring network availability. With information security often defined in the context of the CIA triad (Confidentiality, Integrity and Availability), I find that we often neglect the "Availability" aspect - we tend to consider it as more of an operational thing than a security thing. We'll base our discussion on the diagram below. Again, if you'd like to see something added, please use our comment form - I'll update this diary based on comments. At the heart of many of these protocols and methods is either a primary/backup concept, or an active/active pairing. You'll start this as a pretty consistent pattern as we go through them. What these protocols give you is layer 3 redundancy. If the default gateway on a subnet should go offline, then no-one on that subnet can access resources off of that network. If things like DNS servers are affected in such an outage, it's likely that even resources on that same subnet won't be accessible. 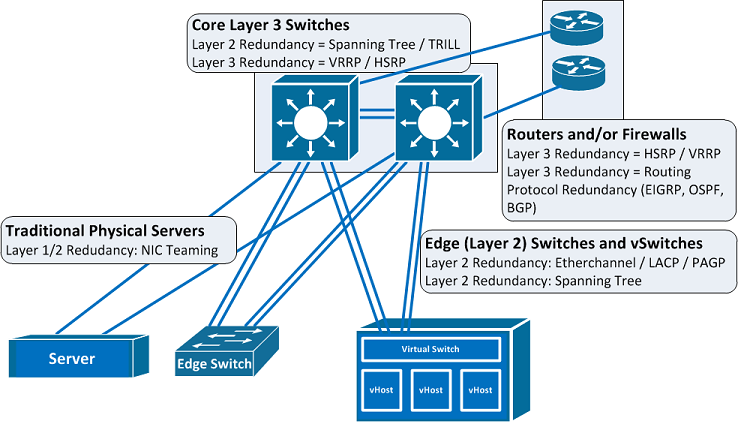 HSRP and VRRP are two protocols that allow you to set up another router (or layer 3 switch) as a backup to the primary. If the primary fails, the backup takes over the gateway IP, and the clients on that subnet are none the wiser. On most days what this means to the network maintainer is that hardware or software upgrades can be done with minimal interruption, often during business hours (we all get enough late nights in this biz). HSRP (Hot Standby Router Protocol) has been around forever, it's the Cisco answer to this problem. VRRP (Virtual Router Redundancy Protocol) is the open standards answer to this - the current version is defined in RFC5798 (previously in RFC3768 and before that in RFC2338). What spanning tree does is prevent loops in the network. If a layer 2 frame is sent out on the wire, and the switch does not have the destination MAC address in it's local table, it sends the packet to all of it's ports in hopes that somebody will claim the packet and reply to it. In a single switch environment, that's the end of it. In a muliple switch environment, this broadcast is potentially repeated on every switch in the environment. The problem is that if you form a loop - in the simplest case, having two wires connecting a pair of switches - this process can easily repeat infinitely. The frame will come in one port from switch A to B, then get forwarded back to switch A on the other link, then back to B and so on. In short order the network "melts" and becomes unusable, as these frames never go away. In a complex network loops may not be so simple or obvious, but the bigger the network the bigger the impact. What spanning tree does is simplify this - it defines a "root bridge", and creates a single, least cost path with no loops between all the switches. Path "costs" are determined in an algorithm based mostly on hop count and port speed, but can be overridden by configuration on the boxes. With a single path (the designated path) to every bridge on the network, frames to unknown destinations transit each switch once, then eventually die if the destination host is not on the network. In the case of a link failure on a designated path, the switches detect that the failure occurred, and one of the backup links takes over (this gets a lot more complicated, stay tuned). The obvious downside to this is that we tend to connect switches together using our fastest, most expensive links. A pair of 10GB links can really add up, cost wise, and even 1GB links can be expensive if it's over single mode fiber or long reach ethernet. Plus it seems a real shame to leave all that bandwidth idle "just in case". The answer to this is a new standard called TRILL (Transparent Interconnection of Lots of Links). In a TRILL config, all of these links are live, and in it's simplest explanation the switches discover and maintain an SPF (Shortest Path First) table of MAC addresses, which defines the best path in a multihop environment from any source to any destination MAC address. TRILL is bright-shiny-new, and is not yet widely deployed. Some vendors have TRILL compliance in their highest-end products, look for TRILL to show up in smaller switches over the next few years. Etherchannel is a common method of taking a few network links and "ganging them up" to make a faster link. For instance, 4 100mbps links can be combined to make a faster channel. The common misconception is that combining these links simply adds them up - in our example, you'd think that 4x100 = 400Mpbs, but that's not the case. What happens is that for every source and destination, a path is chosen. So all the traffic from host A to host B will take one link, and all the traffic from Host A to C might take another. This means that, in our example of 4 links, each conversation has 100 Mbps available to it, but 4 conversations can happen at once. The source and destination can be defined in several ways, commonly by IP address or MAC address. So if you have one large file copy or backup job, it'll likely only use one link. Using Source/Destination MAC address for balancing etherchannel links is generally easier on the hardware, but keep in mind that the default gateway on any subnet has a single MAC, so if you're communicating off your subnet, source/destination IP address might make better use of your multiple paths. Spanning tree is disabled on Etherchannel links. PaGP (Port Aggregation Protocol) is the Cisco implementation of etherchannel. LACP is the standards based protocol (802.3ad). NIC teaming is redundancy at the hardware level for servers. This is usually implemented by installing additional drivers, creating a virtual NIC, then adding the physical NICs to that to create a "team". In most cases the team operates as an active/passive pair, where the passive NIC only kicks in if link fails (ie the cable is pulled) on the active. However, there are usually more advanced options, up to and including support for 802.3ad (see etherchannel above). Routing protocols offer LOTS of avenues for redundant paths and path selection based on various metrics. They give us lots of ways of defining best paths between networks, combining links for performance and detecting and routing around failed links. They also are, almost without exception, based on the "I trust you" model. If you speak their language, you can reroute or hijack any traffic you want. From an attackers perspective, the trick is to then send the traffic back on it's way, so that you can capture a useful datastream - simply being a black hole for packets doesn't accomplish anything, unless you are trying to DOS someone. There have been some noteworthy illustrations of intentional and accidental Denial of Service based on routing protocols - last month's BGP experiment-gone-wrong launched by RIPE-NCC and Duke for instance, or any number of BGP mistakes made by one ISP or another over the years (Pakistan's PieNet DOS of Youtube in 2008 comes to mind for instance). Look for ISC diaries coming up that discuss each of these topics in a lot more depth, from the perspective of defense against an attacker. We'll try to break each one of them, and discuss how best to protect them from compromise.